Kyle Larson back to victory lane at Millbridge takes the point lead! SALISBURY, N.C. – One week after falling short of victory at Millbridge Speedway, Monster Energy NASCAR Cup Series star Kyle Larson struck back to claim his first trophy in two years at the sixth-mile dirt oval. Larson led the final three quarters of Wednesday night’s 20-lap Open Division feature, surging around the outside of polesitter and early leader Tucker Scanlon on a lap-six restart, when Scanlon got sideways coming to the green flag off turn four. Once it got out front, Larson’s No. 1K was unstoppable. He drove off to a one-second lead after weathering two more cautions during the first 10 laps, ultimately holding off a final challenge from Scanlon and crossing under the checkered flag .284 of a second in front. Larson’s victory was his first in the premier class at Millbridge since the Speed51 Open in May of 2016. Scanlon was chasing his first premier-class win at Millbridge after not racing there for most of last year. “Man, if I hadn’t gotten sideways on that start, I think we could have had it,” lamented Scanlon. “After not being here in nearly a year, though, I’ll call what we did tonight a win. We made a lot of changes over the winter … did some testing, and Kevin Hollenbach and I figured a lot of things out. NHRA Pro Stock regular Tanner Gray returned to his dirt-track roots as well on Wednesday night, completing the podium, ahead of defending class champion Carson Kvapil and Clark Houston. Hoffman, who started fifth but was running second behind Larson at halfway, spun in turn two on lap 11 and was hit hard by Nick O’Dell as he slid down to the bottom of the corner. The contact ended both drivers’ evenings. In other feature racing, Tom Hubert led all 20 laps of the 500cc Outlaw division main event, catching a caution with four laps to go just after being passed by New York young gun Andrew Wehrli and then holding the top spot on the final restart. Wehrli finished second ahead of Ryan Millington, Ryan Israel and Dillon Latour. Caden Kvapil wired the Intermediate division main from the pole, leading all 20 laps for his fifth-career class win at Millbridge. Brent Crews, Caleb Bacon, Tyler Letarte and Jordyn Bregoli completed the top five. 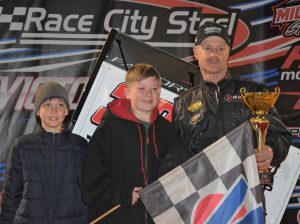 Subbing for opening night winner Sam Corry, Biscuit Williams charged to his first Millbridge outlaw kart win in the Box Stock class, taking the lead from C.J. Sweatt on lap 10 and never looking back. Aiden Turner finished second and Aiden Price crossed third. They were followed by Will Boprey and Hunter Kohn, who led the first eight laps before tangling with Kynzer Flynn on a restart. Coen McDaniel scored his first Wednesday night Beginner Box Stock win since 2016 in that division’s 15-lap feature, beating Ryan Zima and Brody Snyder to the checkered flag. Opening night winner Landon Totherow was fourth.